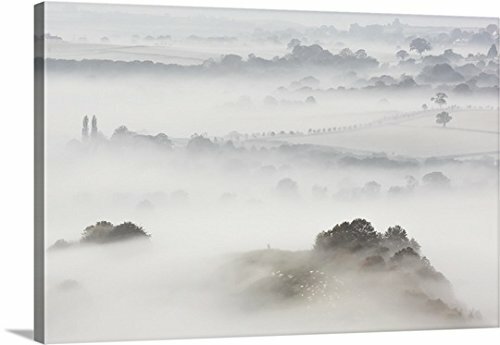 Gallery-Wrapped Canvas entitled 'Wearyall Hill from Glastonbury Tor, Somerset, UK'. Wearyall Hill, the location of the famous Holy Thorn tree, surrounded by mist just before sunrise on a cold winters morning. Multiple sizes available. Primary colors within this image include: Black, Gray, Silver. Made in the USA. Satisfaction guaranteed. Inks used are latex-based and designed to last. Canvases are stretched across a 1.5 inch thick wooden frame with easy-to-mount hanging hardware. Museum-quality, artist-grade canvas mounted on sturdy wooden stretcher bars 1.5" thick. Comes ready to hang.